Hi there, I’m still travelling in the US. I spent a few days with my brother and his family in California which was wonderful as always. And now I’m in Portland, Oregon. Travelling from Normandy, France to the US means a LOT of hours on airplanes, trains and buses for me so I’ve been knitting a lot lately. I’ve already finished a pair of socks I began on the train when I left for the airport last Thursday. 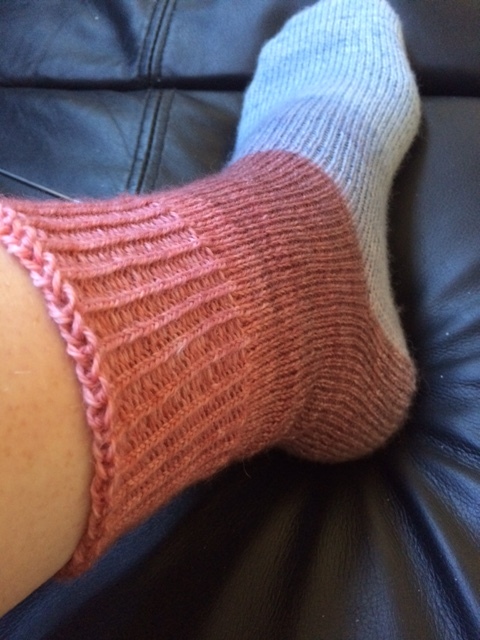 So these are knit with a gradient yarn from Knitcircus and the pattern is Toe Up Socks with a Difference by Wendy D, Johnson. I also cast on for a shawl by Joji Locatelli called In the moment and I’m working on that. I’ve finished the striped part and I have just began working the border in Pumpkin spice. It’s difficult to show my progress because my circular needle is not big enough for me to really spread the shawl out for you to see. I really love how the colours work together. I was a little afraid of the orange being too orange but actually it is just perfect. 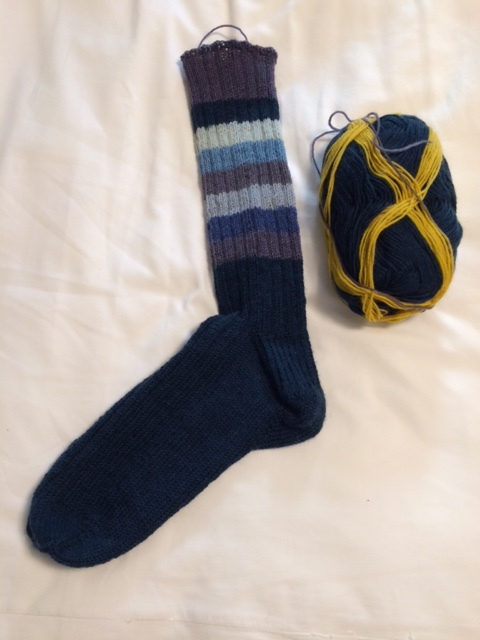 I also cast on for a second pair of socks and have just finished the first sock and about to cast on for the second sock. 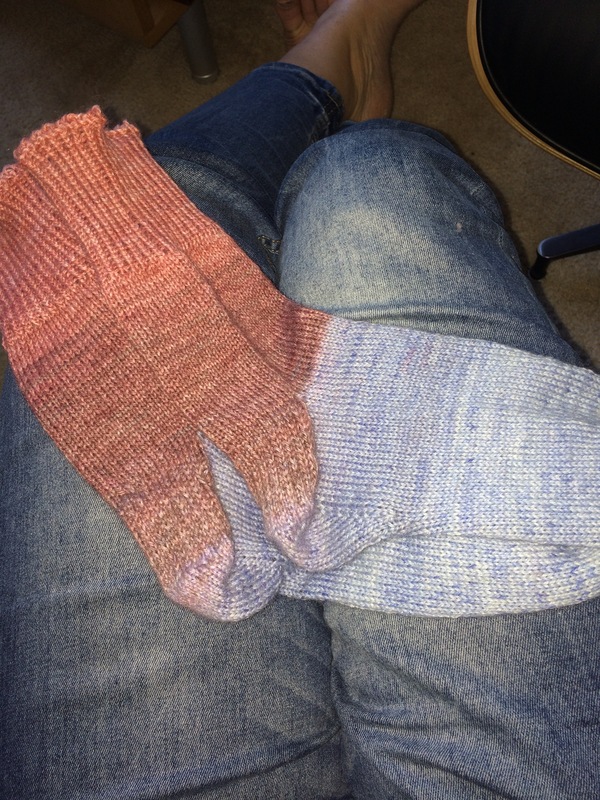 I knit those with the Regia Pairfect yarn. I wanted to use all the yarn so the leg is actually super long/high but that’s ok. I knit in k3,p1 ribbing and I can just either have the leg”crumpled” or I can fold it over. 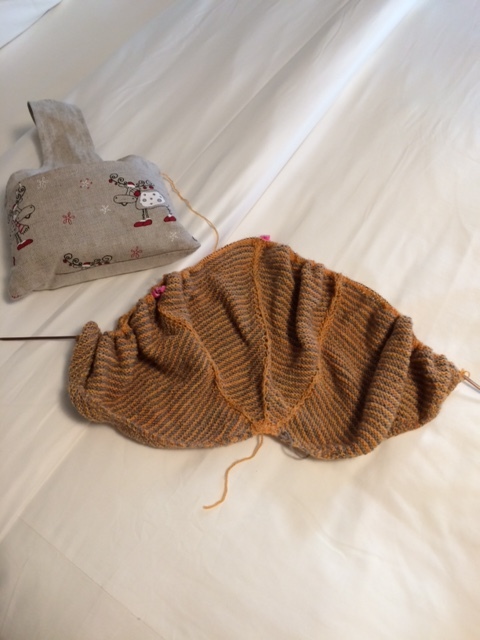 This is also knit using the Toe Up Sock with a Difference pattern. I really like the outcome. 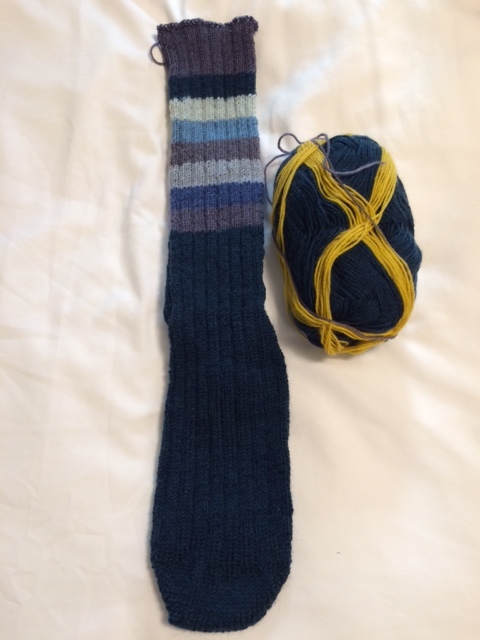 The yellow yarn on the ball is the “separation” yarn that I need to just cut away to begin the second sock at the right place for an identical pair. So here’s what I got: Pompom Autumn 2015 magazine as well as the Interweave Knits Gifts magazine. A cowl pattern by one of the sales ladies at Knit Purl. A set of Knit Picks Carbonz dpns, a kit for a scarf knit in 100% silk, 6 Unicorn tails by Madelintosh and a skein of one ply 100% silk also by Madelintosh. 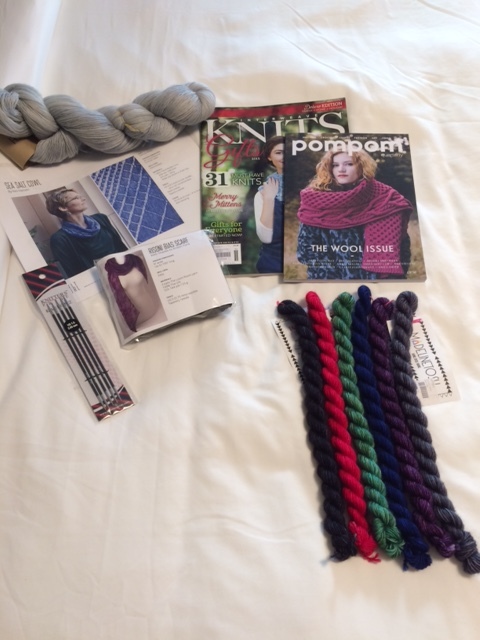 So added to all the other knitting related purchases since I’ve come here I think I can say that this trip has been a serious stash enhancement experience. Much more so than I ever imagined. Not sure if that is a good thing or not but hey, this is a once in a time occasion (maybe) so I’m going to enjoy it! That’s all for today. I have a very busy schedule while I’m here. I’m flying back on Friday and Saturday so lots of knitting in sight. I hope to write to you again after next weekend. And with regards to the shop, that should open this Sunday, October 4th. There will be lots of new yarns so I do hope you will take the time to have a peak at the shop and my new yarns and maybe even let me know what you think about it.